There is a lot of nonsense written about the human body, and this book is no exception. 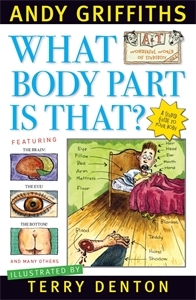 In its 68 fully illustrated, 100 per cent fact-free chapters, What Body Part is That? will explain everything you ever needed to know about your body without the boring technical jargon and scientific accuracy that normally clog up the pages of books of this type. Packed with handy advice such as how to use your head as a bowling ball (the eye sockets and mouth make excellent holes for your fingers), you'll learn more than you ever wanted to know about just what the body does, what it can do, and what you hope it never does.